From Emmeline Pankhurst's 'Freedom or Death' speech and Marie Curie's trailblazing Nobel lecture, to Michelle Obama speaking on parenthood in politics and Black Lives Matter co-founder Alicia Garza's stirring ode to black women, the words collected here are empowering, engaging and inspiring. Thank you to Netgalley, Anna Russell and Quarto Publishing Group - White Lion Publishing for the ARC! So this one….Let me start by saying that I was in need of some true female empowerment when I found this book and I definitely found it! Lately I’ve needed to find inspiration again in the world, in myself to seek it out and prove that it still exists within me. The world is a tough place and this life is not an easy one to navigate, but there are voices so loud time does not stifle them, voices we must listen to in order to find our way again. This is a quick read with colorful, beautiful illustrations of some of world’s most influential women! It’s a must-read, for sure! 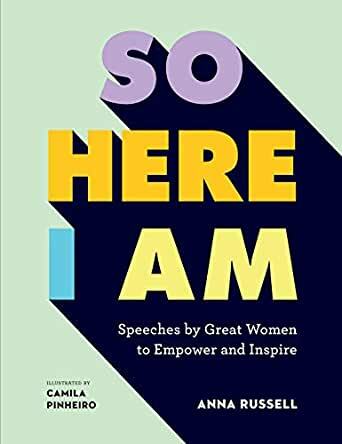 A collection of rousing speeches from some inspiring women, So Here I Am takes the words of these women and puts them in context in terms of history and politics. It is disturbing how true many of their words still are these days despite the vast societal changes since many of them were spoken aloud. The speeches chosen are diverse in topic, ranging from free love and reproductive rights to environmentalism and conservation , and while most of the speakers date from the last couple of centuries,the book opens with a stirring speech from Queen Elizabeth 1 of England. The women who gave these speeches are of course also diverse, so we hear from politicians and journalists, lawyers and writers from all corners of the globe. By its very nature the book could only include a limited number of women, so I was delighted to find a list of other noteworthy women at the end of the book, with suggestions for further reading. As I previously mentioned the miniature biographies of the women provided much needed context, but I also liked the bold stylized portrait illustrations. If I could point out one flaw, it is that in some cases, in the interest of brevity, only excerpts from the speeches were included, but there is a full list of sources at the end which balances this out somewhat. I read and reviewed a copy of this book supplied by NetGalley and the publisher,all opinions are my own. This book is a wonderful resource for anyone (and it should be just about all of us) who cares about women's voices and what women have to say. It was masterfully put together by Anna Russell and includes speeches (although often not the full speech) by women beginning with Elizabeth the First and going historically up through Hillary Clinton and Margaret Thatcher among others. Below are the names of just some of the women in this book; the range is enormous and you will find words of those you know and those whom you are hearing for the first time. Sojourner Truth, Sarah Winnemucca, Ida B. Wells, Emmeline Pankhurst, Emma Goldman, Nancy Astor, Virginia Woolf, Margaret Sanger, Marie Curie, Helen Keller, Funmilayo Ransome-Kuti, Eva Peron, Helen Keller, Ruth Bader Ginsburg, Namomi Wolf, Wilma Mankiller, J.K. Rowling, Julia Gillard, Michelle Obama and Maya Lin. The book opens with an excellent introduction which talks about the author's process in finding and selecting the entries. Along the way, she gives the reader an understanding of the importance of women's written words. Each entry features biographical information, the speech, a full page quote and biographical illustrations of the orators. This book can be read in any order. It is a wonderful resource and would make an excellent addition to any young to older woman's bookshelf...to say nothing of men and boys' shelves too. Many thanks to NetGalley and Quarto publishing for this excellent read. It is is not often that I go on to buy a book that I have been able to review as a galley but this time I will. I want to be able to spend more time with this formidable collection of women's wisdom. So Here I Am is an eye opening look into the speeches and stories of women that history has often casually forgotten or actively erased. The book is full of names and movements I wish I had grown up celebrating in school. With a sense of historical perspective, and humor the writer sets these seemingly old texts into a contemporary context that allows the reader to see how crucial it is that powerful womyn are not erased from history. This book was both eye opening, humorous, and deeply inspiring to read. It includes women speaking out against racism, sexism, homophobia, transphobia, colonialsm, and so much more. And if that's not enough - the illustrations are striking and beautifully capture the essence of their powerful subjects. An amazing read, and an amazing gift to share - especially with the next generation of great thinkers and doers to come ! 4.0 out of 5 starsA very interesting read! This is a book I will order in hardback and keep by my reading chair. Many of these lectures are just what we need to hear on those days we are feeling useless and ineffectual as wives, mothers, employees - women in general. Anna Russell is a woman who knows what it takes to make you sit up and take stock of the plus side of the menu. She has collected prose from journalists, abolitionists, socialists, political activists, women's rights activists and suffragists dating from as far back in time as the 1830's that put our battles for equality in perspective and our accomplishments in shining gold font. The illustrations also are heartwarming. Thank you, Ms. Russell! I received a free electronic copy of this collection of lectures and essays on February 2, 2019 from Netgalley, Anna Russell and White Lion Publishing - Quarto Publishing Group in exchange for an honest review. Thank you all for sharing your hard work with me.